Electroencephalography (EEG) measures the electrical activity of neurons activated in the brain. Metal electrodes are placed against the skull with contact gel and they record brain activity both temporally and spatially. Its use has declined with the advent of other techniques like magnetic resonance imaging (MRI) or computed topography (CT), but EEG has the advantage of being fast with millisecond-range resolution, unlike MRI or CT. The cost of operating an EEG is significantly lower than other techniques and EEG is more forgiving to movement. Patients need not suffer through claustrophobic brain scans. EEG is limited by the spatial resolution it can give and the signal-to-noise ratio is poor, resulting in complex data analysis. The system developed by the UC San Diego team differs by having dry contact sensors that provide high-density brain activity data. The system also monitors 64-channels were conventional EEG monitors 25-32 channels, giving more robust data. The data is transmitted via wireless and is processed in real time. With these and other improvements, the researchers aim to take EEG scanning out of the lab and on the go. With comfortable sensors, the team can monitor patients in practical situations. The headset is shaped like an octopus, with each elastic arm able to stretch about different size heads. Running down each arm is a set of sensors that are placed over the patients’ hair. The electrodes are a composite of carbon and silver on a flexible substrate. The electrodes utilize silver/silver chloride redox pair; unlike conventional electrodes that require a hydrogel matrix to operate, the sensor is encapsulated within the core material that is shielded from outside interference. After designing the headset, Chi worked on the performance of the headset. 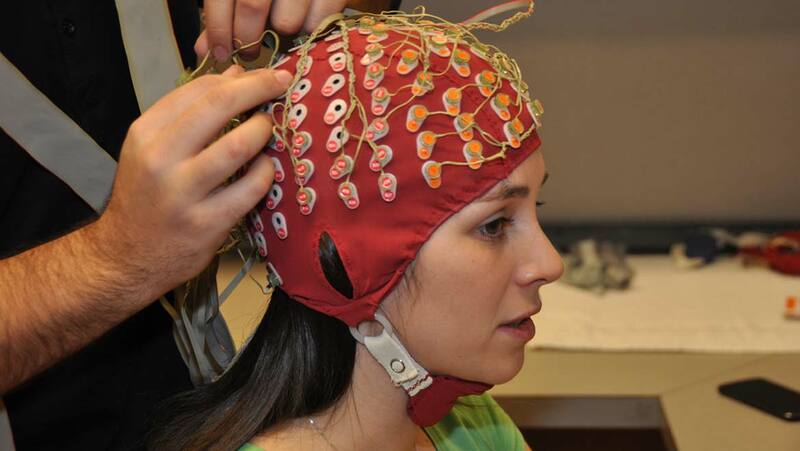 Steps were taken to increase the performance of the EEG while the subject is moving. Though the signal is reliable when walking, the unit suffers when the subject is doing strenuous activity like running. Other improvements that the team is working on are the electronics themselves. The current system functions for only a few hours; the team would like to extend this to days or weeks. Once the data has been collected it must be processed. The difficulty comes from separating the brain signals from the noise. The noise is generated as artifacts from moving, speaking, or autonomic response (breathing or blinking). Mullen and his team programmed algorithms that separate the signals from different EEG components and compare this data with the subjects resting data. The noise is removed as much as possible while preserving the signal. The spatial resolution has always been an issue with EEG. The researchers combine the data collected with detailed brain anatomy and physiology to determine the origin of the signals. The researchers were able to track how different action potentials in the brain interacted with each other. All of this data mapped the electrical network within the brain. The researchers would like to measure the brain’s neural network at the speed of thought but are still years away. Mullen and Chi have created start-ups that focus on the research done to generate the wearable EEG. The headset is available through Chi’s company, Cognionics, San Diego, CA, and features multiple designs for on hair or bare skull contacts. The systems are compatible with multiple physiological sensor inputs. Mullen’s start-up is Qusp Neurotechnologies, is furthering the software interface for processing EEG. The software is cloud based and is can handle sensor data from EEG, as well as other (ECG, EMG, HID), even motion and eye tracking. Mullen would like to expand the interface to mobile systems like tablets or smartphones for real-time, on the spot processing.